Some people are born for it, a stage presence, a brilliant charisma, or even the art of sheer improvisation. Some others train hard for it and they become incredible speakers. 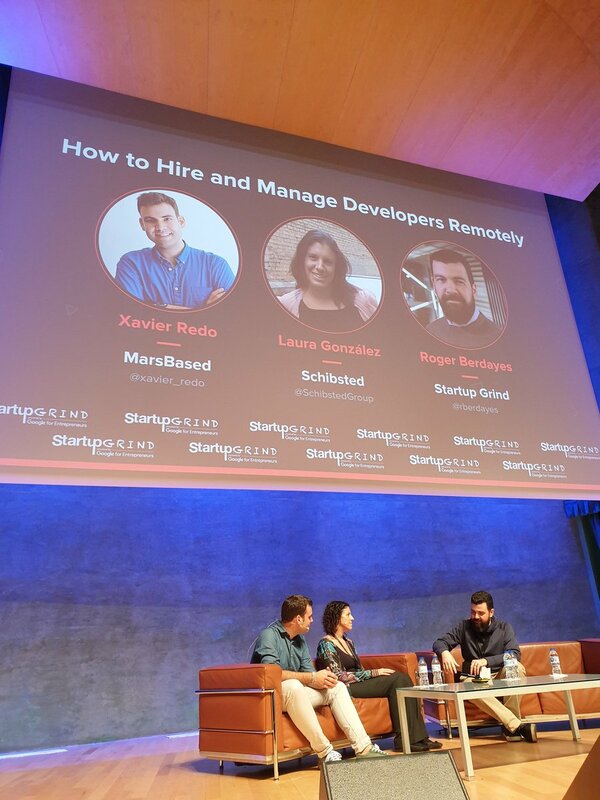 When our CEO Àlex does it every month at Startup Grind Barcelona, it seems very easy, but it's difficult not to think about all those eyes staring at you. All expect good value for their time, or their money if it's a paid event. It is a lot of pressure, as you know they are giving you their time, and therefore they expect good stuff in return: tips & tricks, lessons learnt, fuckups, insightful conversations or just a fun casual conversation with some wisdom nuggets here and there. I know that MarsBased will require me to speak more and more often in events and conferences, and some of them might be big enough sooner rather than later. If this is your case as well, bear with me. I want to give you some advice to be prepared to do this. The first one is you should try to get into the right state of mind. That requires a bit of time, so do not rush into the conference 5 minutes before your appearance (and spare the poor guys a heart attack). Show up early enough and get acquainted with the venue, the stage, the audience, the rest of the panelists and even the interviewer. A bit of mental stretching helps, too. Picture yourself in front of the audience. Try to visualise every little detail (observe yourself from outside, the sofa, the table with the water bottles, and every other detail out there) and fill your mental zone with positive messages such as "I am going to do great!" or "I'm prepared for this". My second piece of advice is to speak slow. The slower you speak, the easier it is to think what you are going to say next. Don't be afraid to remain silent for a while, to allow you some extra time to think. People will perceive you as a thoughtful person. Also, it won't feel like the interview has been prepared and you're just throwing out canned responses. In short: we tend to blurt out too many things and speaking too fast if we're nervous. Slowing down will help others to understand you better. Third, try to identify a focusing object. This object will be your focusing anchor and will help you to forget about the rest. This object can be your bottle of water, the door at the back of the audience, a sign, or literally anything. In the conference, I had people shooting photos and videos, flashes, people entering/leaving the room and a couple of other distractions. All of these can distract you if you're not trained enough. This focusing object will act as a totem to make you return to a calm mental state of mind if things start to go south. For example, taking the bottle of water and drinking a little helps me, but it could as well be changing your position on the sofa to a more comfortable one, or even adjusting your watch. The last one, and this is not mine, it is from Roger, the interviewer in the panel. Fear and excitement are two similar feelings. Most of the time can be confused one with the other. That's why we like horror movies and/or rollercoasters. Try to transform the scenic fear into excitement and everything is going to work better. I will try to continue speaking in front of audiences in English to improve over time. 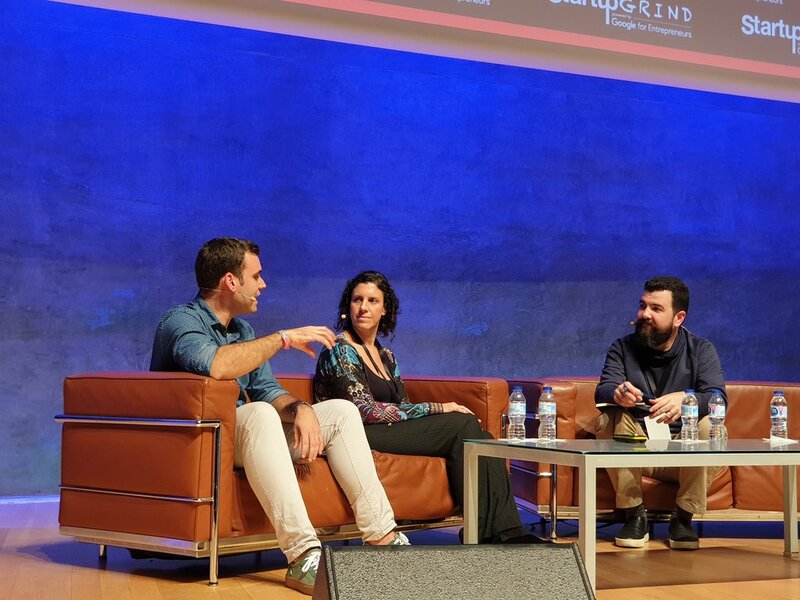 Next step will be Dec 4th in the Fuckup Nights event, organised by Carlos Cruz, codirector of Startup Grind Barcelona.